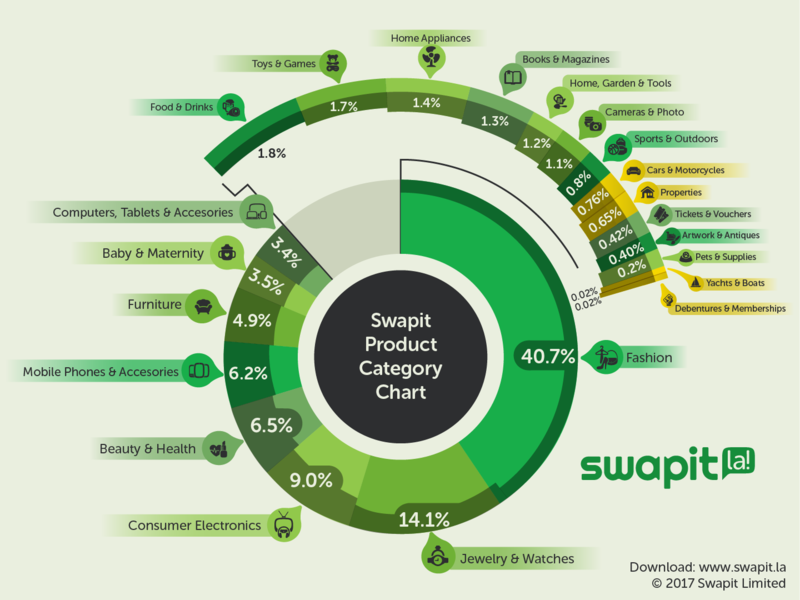 Swapit has seen some phenomenal growth in the year 2016 that has just passed. Our community has increased significantly and the activity on our marketplace is growing day-by-day. To ensure, we are addressing the right audience, we keep a close eye on how our users are using Swapit, what’s useful, what can be improved and especially what kind of content they like. I am already excited how 2017 will turn out. We have some serious changes for Swapit in the making and our growth projections are even more exciting. Stay tuned for more on that! We wish everyone a Happy Lunar New Year! Following my blog post yesterday about “Swapit Ranks #1 on Google Search” I decided to throw in an extra hour of work to do research on the latest SEO trends. While ranking #1 for your own product name is a very good thing when it comes to rather generic names like Swapit, it is still not the ultimate goal we want to achieve. In the long run, we need to rank very high for search terms like “second hand”, “used stuff”, “marketplace”, etc. in English as well as their equivalents in local languages. Google’s search algorithms are constantly changing. Just tiny changes can have a big effect on businesses across the globe. Yet, we had some elementary mismatch between our blog URL and our website. At the same time, we’ve always had a forwarder called http://blog.swapit.la, which automatically forwarded the reader to https://swapitblogit.wordpress.com. While that worked well for normal humans, it basically cuts off the Google search spider at the first step before the forwarding. Furthermore, all content published on this blog under https://swapitblogit.wordpress.com, did not have any effect on the content creation on our website http://swapit.la. As a result, all backlinks our blog generated, only lead back to our blog. Those backlinks are important for our SEO ranking and therefore, we need them to lead to our main website. When you’re a startup, many things are about money and how much you spend for what. In our case, I did not want to host our blog ourselves, so we’re hosting it on wordpress.com. You get a free sub-domain with the free account, so we chose https://swapitblogit.wordpress.com. If you want to map a custom domain to your blog, you’ll have to pay. For a long time, I’ve been resisting that, to save money and also because I thought it might not be that important to map our own domain to our blog. After yesterday’s blog post and quite a bit of research, I realized it is actually important to map your own and I should have done that much earlier. In the end, it costs only US$13 per year to map your own custom domain a wordpress.com blog. Sure, it costs wordpress.com literally nothing to offer that service, but that’s what they charge. So the change has been done and it is working quite. All of our old links still work the same way they worked before. They’re just all forwarding to our new domain. Now, we have the folks that might say: “http://swapit.la/blog is even better than a sub-domain at http://blog.swapit.la“. That might even be true, but I haven’t found any concrete evidence of that. Yet, several folks reported that such a “sub-directory” setup does somehow rank higher on Google. Perhaps that is true, I can’t really tell at this moment. As we are using Strikingly for our main company website, we actually can not easily map a “sub-directory” from that website to a separate blog. So that’s something out of question at the moment. At least until either Strikingly adds that functionality or we move our main website to a different hosting service or self-host it. Anyhow, I’ve scheduled a task for myself in a month’s time to review the change in Google Search index ranking and re-evaluate if any additional changes are needed, and especially if this recent change has paid off. Until then, stay tuned for more on what we’re doing at Swapit and why we’re doing that. It appears earlier this year in January, the online service Owler has created a comparison chart, which compared four companies in the peer-to-peer marketplace field with each other. One of them was Swapit! It came mainly from the angle of comparing the US/Barcelona-based, South-African-backed company letgo with the rest of the world. Given that letgo has now raised over US$200M in funding (and acquired its competitor Wallapop), and OfferUp has also raised hundreds of millions; it is an honor to be named along with them at the same time. Funny enough, they have some kind of CEO-ranking, in which for some reason, I seem to score rather high. Yet, I believe everyone on the chart is doing a great job and some folks have a lot more experience than me and would definitely deserve a higher score. As of today, our blog has actually grown to a staggering 189 blog posts since we launched with our first blog post on January 23rd, 2015: The idea behind Swapit. We are in constant contact with our users. That’s important, because only that way we find out about road blocks they might have and things that might slow them down when using Swapit. While Swapit has grown into a great marketplace app, where our users can trade efficiently, privately and in a seamless manner; there is always space for improvement. We will not rest if we can still improve the life of our users. These can be simple things, like making them smile the first time they start Swapit because a lovely “Swapit la!” voice comes out of their phone. It’s informative and functional. We show such startup dialogs because we want to communicate to our users what has changed. We want to be sure they are aware of the cool new features we’ve just put into Swapit. Like on iOS for example, you can post your items for sale at multiple locations. No other app has that kind of feature! While these dialogs serve a purpose, they are however, rather ugly. The launch experience is diminished by them showing up. They’re too text heavy, not catchy enough and are missing a certain twang. That dialog does show way too often as well. For example, it always shows when after the app was force-closed or after the phone was rebooted. In short: it gets annoying. That’s exactly the kind of feedback we’ve received from our users. Most appreciate our intention to communicate, but generally, it needs to be done more subtle and with more style. Granted, we have quite some space for improvement on that front. At the same time, we also know that we have many other dialogs that might show up at app start. Say for example, when a user’s account got suspended, when we have a new version everyone needs to update to or when the user receives some referral reward, and so on. In fact, we have identified 15 different cases so far of what can happen when or better what we want to show at startup in each of those cases. That’s a lot. All such elements are optional, but generally, we would almost always use at least an image, text and an action. At the same time, we are also taking care of what happens when we would want to show multiple startup dialogs at the same time. The best way we could think of, was to prioritize all kinds of dialogs that would show up. Say for example an “Account Suspended” dialog has the highest priority, so in case a “Welcome” dialog would want to show as well, the “Account Suspended” dialog received precedence to show up and lock the suspended user out. Of course, there’s an action offered to contact us and resolve the issue. Furthermore, we combine this with a queueing system. Sometimes it happens, we want to show two things at a time, but one dialog is more important, so that dialog shows. However, the other dialog, which was not shown, might be important enough that we still want to show it at some point in time. So we’re putting in a queueing system that allows us to queue a dialog to show it the next time. While I am writing this down, I am imagining someone reading it and thinking: “Isn’t all of this a bit overkill for just a simple startup dialog?” Well, I believe it is absolutely important to make sure our users are not annoyed by any step inside our app. So if our startup currently shows up too often and if it is just too ugly right now, we need to change that. But if we change it, we change it properly. Our users deserve nothing but the best. Since the onset, we’ve been iterating at an amazing pace. Not just in terms of Swapit app releases (we’ve released over 140 thus far), but also in terms of designs. We’re constantly evaluating, creating design drafts, changing things up, adjusting, adding design elements, removing them, and so on. Most of which is driven by user feedback. Obviously, the above screen shot only shows 3 of those 15 mentioned cases, so you can imagine how massive our design iterations can be like. It is a time consuming process, but it helps us a lot to understand how people navigate through Swapit and it is absolutely necessary to be able to provide the best design and user experience to our users. We will not rest until everyone is happy and we will make sure that Swapit works like and feels like everyone expects it to. As part of being an incubatee at the Cyberport Incubation Programme, I took part in a training session at Cyberport. Together with other Cyberport incubatees and CCMF grantees, we have had a great coach that brought each of us closer to our individual goals. We never stop learning and every day we discover something new, something worth trying, but we never leave our final goal out of sight. Getting some guidance from time to time, helps a lot to focus. At the same time, it was also great to hear from fellow startup founders what their challenges are and what they are trying to accomplish. There is so much talent in Hong Kong and there are so many founders out there, which have some great ideas. I am sure they will succeed in their endeavours. More Swapit product news are coming soon. Stay tuned! We just updated Swapit and you can now get Swapit Premium for free if you invite one of your friends to join Swapit too. It’s easy, quick and you can share your invite anywhere. WhatsApp, Facebook, WeChat, Twitter, Email, text SMS, you name it. Both you and your friend will receive a Swapit Premium Day Pass. In detail it works like this: As soon as one of your friends joins Swapit, a popup dialog appears and tells him or her that the Swapit Premium Day pass has been earned and is active now. At the very same moment, you will receive an instant notification about your friend joining and a new Swapit Premium Day Pass was added to the “Rewards” tab in the “Free Swapit Premium” section on Swapit. Swapit Referral works across Android and iPhone. So if you’re an Android user and invite a friend with an iPhone, you will receive your free Swapit Premium Day Pass as well as if you’d be inviting another Android user, or if you’d be an iPhone user and invite another iPhone or another Android user. Once you’ve sent out your invite to your friend, just wait and let magic happen. You can also invite another friend in the meantime and you’ll end up with two Swapit Premium Day Passes if both join Swapit! Our sellers will get access to Swapit Premium without having to pay for it. It will increase the visibility of their postings and allow them to sell items much faster. As a result, we will be getting more items posted on Swapit and the market becomes more and more liquid. New users will be invited, the word about Swapit will spread even faster, because people want to give Swapit Premium a try and invite their friends. Existing users who are predominantly buyers right now, will be incentivized to post items for sale on Swapit, once they earn a Swapit Premium Day Pass. New users who receive their free Swapit Premium Day Pass on signing, will be more motivated to post items for sale as quickly as possible. Their Day Pass starts running for 24 hours from the moment they’ve installed the app and created an account. So within those 24 hours, they are more motivated to post as many items as possible for sale – so they can take full advantage of the Swapit Premium Day Pass. So generally, we believe this will increase Swapit’s adoption across the board. Let’s see how it goes. We will blog about the results and effectiveness here. So stay tuned for upcoming blog posts!